Like many little girls, Julie Buzby longed for the fuzzy friendship that only a dog or cat can offer. But her father's job in the military kept the family moving, making it difficult for them to provide a stable home for a four-legged friend. The closest she ever got was a pet hamster named Elfe. "We did a lot of traveling," Julie recalled. "My parents have all these wonderful memories of the historical sites they took us to see, but my favorite memories were always of the animals -- like feeding the pigeons in Prague and the prairie dogs in Yellowstone Park." Somehow Julie knew from the time she was a toddler that one day she'd grow up and surround herself with furry friends. She set her sights on becoming a veterinarian -- and by the time she was in high school, she and her Mom were on the road again, traveling thousands of miles by car, so that Julie could find just the right school. Eight years later, she accomplished her dream, and it wasn't long before she established a successful practice on a 40 acre farm. From the outside, it appeared that Julie had it all. A thriving practice, a loving husband who she'd met through one of her patients -- a rottweiler named Roxette -- and soon after, a baby girl named Abigail. "When my daughter was born," Julie laughed, "my staff was a little nervous because I was so non-maternal! My life had been defined by my work. But the first time I held her, I fell in love and suddenly there was a competing interest." The good news was that Julie and her husband, Tim, lived on the same property as her practice -- so while Tim took on most of the domestic duties, Julie could run back and forth to the house, in between patients. But as their family continued to grow, the dedicated veterinarian began to feel torn between her two loves. "We had four kids in six years," Julie continued, "and I felt like I was missing out on so much of their lives. I just didn't feel like I was being the mom I wanted to be. And I realized I didn't want to be in a business that tore my heart away from the home." But rather than simply shutting down the practice, Julie and Tim took a much bolder step. Julie knew that she couldn't bear to see her patients trotting through town, so the couple moved their family across the country, from Central Pennsylvania to Beaufort, South Carolina -- not sure of what they'd do, but certain they needed to find a new way of life. It was that quest for balance that would lead Julie to her biggest discovery of all -- and ironically, provide a different sort of balance for pets around the world. "We sold the farm and the practice," she explained. "We never lived extravagantly, so we could allow ourselves a year to regroup. And by the time we got to Beaufort, I discovered I was pregnant with twins. I was pretty sick, so I wasn't really looking for anything. But I got a call from a local veterinarian, who'd heard that I was certified in acupuncture and he needed someone to help with his training." Before Julie knew it, she was working in the vet's clinic one day a week -- lending a more holistic approach to the practice. And while that might have been enough for the busy mom, the day a dog named Morgan walked in, she found herself on a mission. "We were having an open house for the hospital," Julie remembered, "and our friend Todd walked up with Morgan, his 16 year old Australian shepherd. He said, 'Hello, Julie, look what I did for Morgan.' He had me at hello." "Todd had put these little devices on Morgan’s toenails to keep her from slipping on hardwood floors. She was making so much noise as she moved through the house, that Todd's wife, Stephanie, who worked with us at the hospital, asked if there was something he could do about it. They were just hoping for a quieter home, but I took one look at what he had created and knew it was revolutionary." What Julie saw was a solution that would give her patients traction -- kind of like soccer cleats do for kids. "Dogs are designed to use their nails for traction. They don’t slip around out in the wild. But when you bring them into a fancy home, it becomes challenging for some to keep their balance on hardwood floors. That's terrifying for an older dog, or one that's disabled by an injury. I've heard hundreds of stories about dogs being stranded in a place that feels safe for them, and owners who have covered their homes with throw rugs so their pets can move freely." "I'd been able to help my patients with mobility and pain, but I could never do anything about the slipping. I knew that the devices on Morgan's toes had the potential to change the lives of dogs and their owners. They were like snow tires for dogs." Julie began testing them on patients and watching in amazement, as dogs that had been slipping on the veterinary hospital floors, instantly found their footing. She even witnessed a 15-year-old Scottish terrier named Gus, who was so weak that he had to be carried up stairs, find the stamina to run up an entire flight. "I was so excited that I was texting Todd 58 times a day with potential names for the product. Poor Todd finally said, 'Julie, I have other projects I’m working on. If you don’t so something with this, it's never going to get out there. So if you can do it, you have our blessing." So Julie moved forward and applied for a provisional patent -- buying herself some time to test market the product, before investing the money it takes to put a utility patent in place. Then she began contacting manufacturers who could make natural rubber rings that would slide onto the tips of a dog’s toe nails. "I spent all of 2012 just doing research and development," Julie remembered. "I asked colleagues around the country to measure the circumference of dog's toe nails with dental floss while they were under anesthesia. I bartered my vet services for graphic design. By that point, we'd had our seventh child, Joseph -- so we didn't want to go into debt with a bank loan." But when a sales rep for one of the premier veterinary suppliers in the country suggested that she make her way to a trade show where his big bosses would be, Julie knew she had to move into fast forward. "It was like a modern day barn raising," she said with a smile. "A client had gifted us $10,000 towards the patent. She wanted so much to support us, that when we said we couldn't accept it, she left the money in a plastic bag on our door! With her approval, we used that money to rent a booth and begin manufacturing. I had 27 people all over the county helping us package our product." And then, in a twist of fate, Julie got a call from someone managing the trade show floor. There had been a mix-up with the booths, and they were offering a space that was twice the size at no extra charge. As it turned out, the new location was so prominent that the product Julie had named ToeGrips, became the talk of the trade show. That week, the pet loving entrepreneur made every penny of the $10,000 she had invested back. But what she didn't know, until months later, was that 13 year old Abigail -- the baby who was the first to win Julie’s heart -- had helped them win a contract with the veterinary supplier they had gone there hoping to meet. 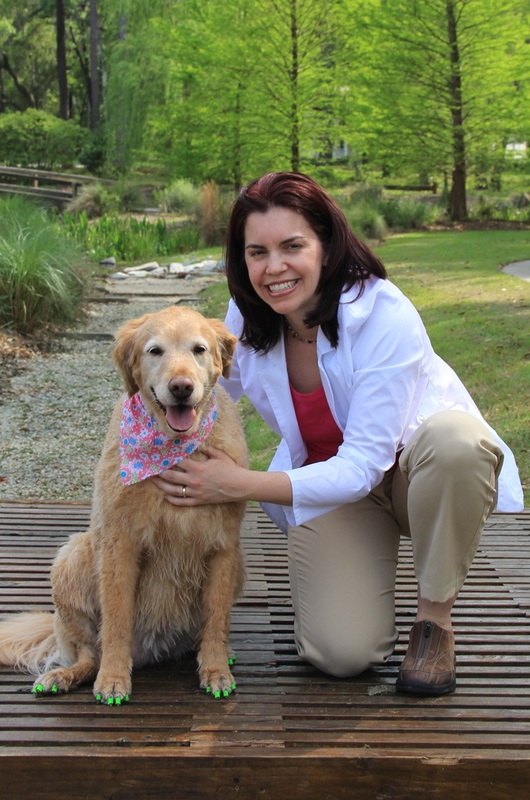 "I got a call out of the blue from the Vice President of Marketing for MWI Veterinary Supply. He apologized for not calling sooner and explained that he had stopped by our booth while I was away and that Abigail had given him the best presentation he'd ever heard. And then he went on to tell me why we should do business with them!" Today, ToeGrips are in 500 veterinary hospitals worldwide, and Julie is projecting 2014 revenue to be at a quarter of a million dollars. The little company that was created to keep precious pets from slipping has definitely got some traction. "Along the way," Julie sighed, "there have been colleagues who have looked at me like I was some sort of con artist selling snake oil. I had to explain to them that I owned a practice and sold it -- and that I wasn't intending to start a pet product business. But this has changed the life of my patients. It’s given them back their confidence. And I want that for their patients too." 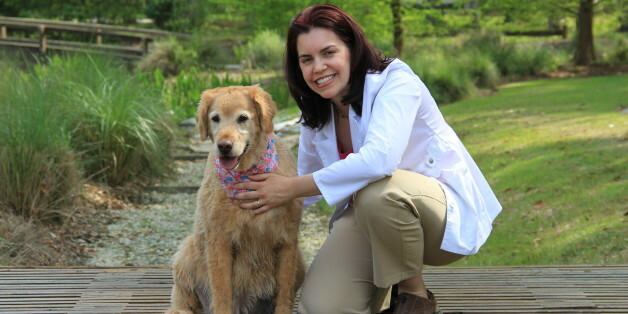 Julie Buzby's life-long passion for animals drove her to pursue a career as a veterinarian. This same passion would also lead her to become an entrepreneur and founder of one very useful pet product. Here, she poses with Chloe, a beautiful golden retriever.